You can probably get away with most things that you put on it. But here are a few things that are best avoided on your countertops if you want to look as good as new. Granite is resistant to liquids and does not get stained. That’s true. But as part of the upkeep process, make it a habit to wipe up liquids as soon as you can. We have heard stories where cranberry juice left over a period of hours on a white granite countertop left a mild stain that they couldn’t get rid of. If you have a dark coloured countertop, then you may have less to worry about. 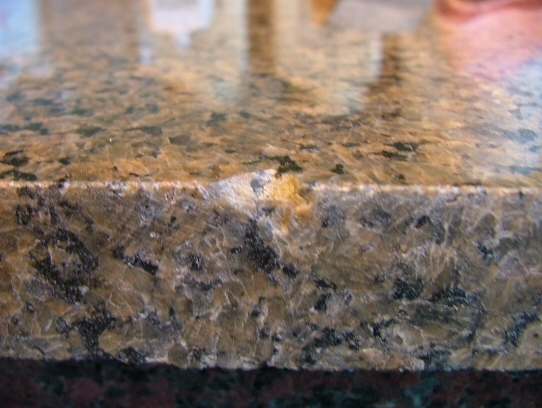 When continually exposed to oil, even granite can get stained. So if you have oily sauces or residual oil on the bottle, then keep it a cupboard. Occasionally keeping a hot pan on the granite won’t damage it, especially if your granite slab is thick and is well protected by sealant. But if you make it a habit, then the sealant can start to weaken. Use trivets and potholders when you are cooking. And if you spill something hot on the granite, wipe it as soon as you can. Any cleanser with acidic content including Vinegar, Lemon juice or ammonia are best avoided. Lemon juice can cause the most damage due to the calcite content in it. So, if you accidentally spill any lemon juice on the countertop, clean it. Granite measures from 6 to 8 on the Mohs scale of hardness. That makes it one of the strongest igneous rocks ever. So it can sustain the weight of all the pots, pans and appliances that you subject it to. But if you want to change the light bulb, please use a step ladder and spare the countertop. Do not test its resilience to weight by standing on it. Soap and water is the easiest way to clean your granite. But you do not want to leave any residue since it can make the countertop look dull. Clean off any remaining soap and liquid.